- Publisher A Lifetime of Blessing is a broad-ranging and imaginative resource that will encourage and inspire us to count our blessings. New and original prayers and benedictions from a great variety of writers, drawn from every continent and many cultures, invite us to pause and give thanks for the many ways in which God's presence is made known in our lives. This anthology celebrates countless good gifts that surround us, yet also reminds us that the blessing of God does not equate with material comfort and the rewards of success. 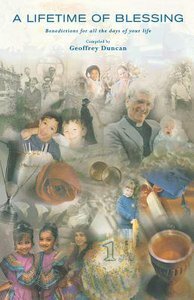 About "A Lifetime of Blessing"
A Lifetime of Blessing is a broad-ranging and imaginative resource that will encourage and inspire us to count our blessings. New and original prayers and benedictions from a great variety of writers, drawn from every continent and many cultures, invite us to pause and give thanks for the many ways in which God's presence is made known in our lives. This anthology celebrates countless good gifts that surround us, yet also reminds us that the blessing of God does not equate with material comfort and the rewards of success. Duncan is the Church and Society Consultant for the Thames North Synod of the United Reformed Church.